What does a weaker Aussie dollar mean for your investments? Australians are well known for their love of travel. Along with Kiwis, we’re probably the most prolific travelers in the world. This intrepid nature means that many Australians understand currency risk. For a long time the strong Aussie dollar meant we all had extra overseas spending money and could seek out online bargains from US retailers but times have changed and the Aussie has slipped from its peak of $US1.10 in 2011 to $US0.74 in 2018 (1). This may curtail travel plans for some, but what does this mean for our overseas investments? 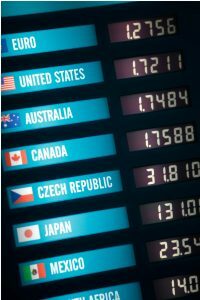 “Overseas investments expose your portfolio to currency risks and opportunities because international shares are purchased in their ‘home’ currency. This means changes in the value of that currency relative to the Australian dollar will affect the gains or losses on the investment when the money is converted back” says Mark Rider. Simply put, a stronger Australian dollar will decrease the value of your international investments because your overseas shares now buy fewer Australian dollars than when you first invested. Conversely, a weaker Australian dollar will increase the value of your international investments. The US dollar has strengthened this year as the US Federal Reserve (Fed) has gradually raised interest rates offering investors increasingly higher yield on US debt vs Japan, Europe and emerging markets. The Australian dollar has weakened a little over the past year as the RBA has remained content to keep rates on hold. This trend may continue into the future, although it is reliant on a sustained period of rate hikes by the Fed, which is far from guaranteed. We should also consider that iron ore prices are expected to continue to drift lower and this may mean the Aussie could drift lower too. China’s main economic engines have changed over the past decade with growth increasingly driven by the consumer and the services sector and less so by construction and exports. The latter remain critical for the Australian economy, and particularly the Resources sector. While we expect this trend to continue, risks on the horizon from a potential trade war with the US may also place increased downward pressure on the Aussie against the US dollar. Against other currencies such as the Euro and the Yen, the outlook is better. Australia still has a large interest rate differential with these currencies. While a slightly weaker Australian dollar may look like a signal to invest more overseas, bear in mind that a weaker dollar is a positive for Australian companies who export goods and services, such as our farmers, as it makes them more competitive. Tourism, higher education and companies who generate a lot of their earnings from offshore operations also benefit. On the flip side, companies who need to import or buy goods from overseas will feel the pain. investment time frame and the performance of the overseas asset. Equally, investors need to consider if they’re aiming to maximise returns or to reduce overall portfolio risk. with exposure to hedged and unhedged investments. Either way, currency risk on investment performance is incredibly hard to predict” says Rider.